A surveyor at work with an infrared reflector used for distance measurement. Surveying or land surveying is the technique, profession, and science of accurately determining the terrestrial or three-dimensional position of points and the distances and angles between them, commonly practiced by surveyors, and members of various engineering professions. These points are usually on the surface of the Earth, and they are often used to establish land maps and boundaries for ownership, locations like building corners or the surface location of subsurface features, or other purposes required by government or civil law, such as property sales. Surveyors use elements of mathematics (geometry and trigonometry), physics, engineering and the law. Surveying equipment includes total stations, robotic total stations, GPS receivers, prisms, 3D scanners, radios, handheld tablets, digital levels, and surveying software. 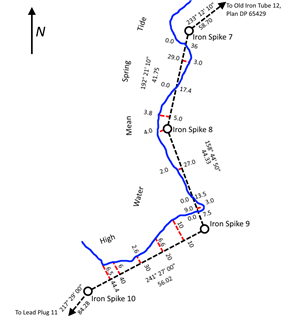 An alternative definition, from the American Congress on Surveying and Mapping (ACSM), is the science and art of making all essential measurements to determine the relative position of points or physical and cultural details above, on, or beneath the surface of the Earth, and to depict them in a usable form, or to establish the position of points or details. Furthermore, as alluded to above, a particular type of surveying known as "land surveying" (also per ACSM) is the detailed study or inspection, as by gathering information through observations, measurements in the field, questionnaires, or research of legal instruments, and data analysis in the support of planning, designing, and establishing of property boundaries. It involves the re-establishment of cadastral surveys and land boundaries based on documents of record and historical evidence, as well as certifying surveys (as required by statute or local ordinance) of subdivision plats or maps, registered land surveys, judicial surveys, and space delineation. Land surveying can include associated services such as mapping and related data accumulation, construction layout surveys, precision measurements of length, angle, elevation, area, and volume, as well as horizontal and vertical control surveys, and the analysis and utilization of land survey data. Surveying has been an essential element in the development of the human environment since the beginning of recorded history (about 6,000 years ago). It is required in the planning and execution of nearly every form of construction. Its most familiar modern uses are in the fields of transport, building and construction, communications, mapping, and the definition of legal boundaries for land ownership. Basic surveyance has occurred since humans built the first large structures. The prehistoric monument at Stonehenge (c. 2500 BC) was set out by prehistoric surveyors using peg and rope geometry. In ancient Egypt, when in the Nile River overflowed its banks and washed out farm boundaries, boundaries were re-established by a rope stretcher, or surveyor, through the application of simple geometry. The nearly perfect squareness and north-south orientation of the Great Pyramid of Giza, built c. 2700 BC, affirm the Egyptians' command of surveying. The Groma surveying instrument originated in Mesopotamia (early 1st millennium BC). The Mathmetician Liu Hui described ways of measuring distant objects in his work Haidao suanjing or The Sea Island Mathematical Manual, published in 263AD. Under the Romans, land surveyors were established as a profession, and they established the basic measurements under which the Roman Empire was divided, such as a tax register of conquered lands (300 AD). In Medieval Europe, the practice of Beating the bounds was the practice of gathering a group of residents and walking around the boundaries of a parish or village to establish a communal memory of the boundaries. Young boys were included to ensure the memory lasted as long as possible. In England, the Domesday Book, commissioned by William the Conqueror in 1086 recorded the names of all the land owners, the area of land they owned, the quality of the land, and specific information of the area's content and inhabitants, although it did not include maps showing exact locations. A plane table was described by Abel Foullon in 1551, but it is thought that the instrument was in use earlier as his description is of a fully developed instrument. Gunter's chain, introduced in 1620 by English mathematician Edmund Gunter, enabled plots of land to be accurately surveyed and plotted for legal and commercial purposes. 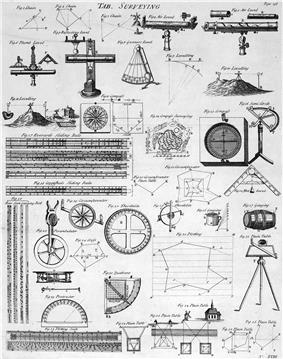 In the 18th century, modern techniques and instruments for surveying began to be used. The modern theodolite, a precision instrument for measuring angles in the horizontal and vertical planes, was introduced by Jesse Ramsden in 1787. He created his great theodolite using a very accurate dividing engine of his own design. Earlier, more primitive devices, had been invented by Leonard Digges, Joshua Habermel and Jonathan Sisson in the previous centuries, but Ramsden's theodolite represented a great step forward in the instrument's accuracy. William Gascoigne invented an instrument that used a telescope with an installed crosshair as a target device, in 1640. James Watt developed an optical meter for the measuring of distance in 1771; it measured the parallactic angle from which the distance to a point could be deduced. The modern systematic use of triangulation was introduced by the Dutch mathematician Willebrord Snell, who in 1615 surveyed the distance from Alkmaar to Bergen op Zoom, approximately 70 miles (110 kilometres), using a chain of quadrangles containing 33 triangles in all. Snell calculated how the planar formulae could be corrected to allow for the curvature of the earth. He also showed how to resection, or calculate, the position of a point inside a triangle using the angles cast between the vertices at the unknown point. These could be measured much more accurately than bearings of the vertices, which depended on a compass. This established the key idea of surveying a large-scale primary network of control points first, and then locating secondary subsidiary points later, within that primary network. Between 1733 and 1740, Jacques Cassini and his son César Cassini undertook the first triangulation of France, including a re-surveying of the meridian arc, leading to the publication in 1745 of the first map of France constructed on rigorous principles. Triangulation methods were by then well established for local map-making, but it was only towards the end of the 18th century that detailed triangulation network surveys were established to map whole countries. A team from the Ordnance Survey of Great Britain, originally under General William Roy, began the Principal Triangulation of Britain using the specially built Ramsden theodolite in 1783. This survey was finally completed in 1853. The Great Trigonometric Survey of India, which ultimately named and mapped Mount Everest and the other Himalayan peaks, was begun in 1801. The Indian survey had an enormous scientific impact; it was responsible for one of the first accurate measurements of a section of an arc of longitude, and for measurements of the geodesic anomaly. Surveying became a professional occupation in high demand at the turn of the 19th century with the onset of the Industrial Revolution. Surveyors were used on industrial infrastructure projects, such as canals, roads and rail, and the profession developed increasingly accurate instruments to aid its work. In the USA, the Land Ordinance of 1785 created the Public Lands Survey System, which formed the basis for dividing the western territories into sections to allow the sale of land. States were divided into township grids which were further divided into sections and fractions of sections. Napoleon Bonaparte founded Continental Europe's first cadastre in 1808. This gathered data on the number of parcels of land, their value, land usage and names. This system soon spread around Europe. Robert Torrens introduced the Torrens system in South Australia in 1858. Torrens' system was intended to simplify land transactions and provide reliable titles via a centralised register of land. The Torrens system was eventually adopted in several other nations of the English-speaking world. Because of the fundamental value of land and real estate to the economy, land surveying was one of the first professions to require professional licensure. In many jurisdictions, the land surveyor's license was the first professional licensure issued by the state, province, or government. At the beginning of the century surveyors still faced the problem of measuring long distances accurately, despite improvements over the older measuring chains and ropes. During the 1950s, the Tellurometer, developed by Dr Trevor Lloyd Wadley was developed to measure long distances using two microwave transmitter/receivers. During the late 1950s Geodimeter introduced Electronic Distance Measurement Equipment(EDM) using the principles of measuring the phase shift of light waves that are still used by modern instruments. These instruments were able to measure between points many kilometers apart in one go, sometimes saving the need for days or weeks of chain measurements. Advances in electronics allowed miniaturisation of EDM and in the 1970s the first instruments combining angle and distance measurement were produced, becoming known as total stations. Gradually manufacturers added more equipment such as tilt compensators, data recorders, and onboard calculation programs, bringing improvements in accuracy, and speed of measurement. The first Satellite positioning system was the U.S. Navy TRANSIT system. The first successful launch took place in 1960. The system's primary purpose was to provide position information to Polaris missile submarines, but it could also be used by surveyors with field receivers to determine the location of a point. The small number of satellites and bulky equipment made observations slow, difficult and inaccurate, so usage of this system was limited to establishing benchmarks in remote locations. The first prototype satellites of the Global positioning system were launched in 1978. Initially another military system, GPS used a larger constellation of satellites and improved signal transmission to allow more accuracy. Early GPS observations required the receiver to be fixed in a static position for several hours to collect enough observations to reach survey accuracy requirements. Recent improvements to both the satellites and the receivers allow high accuracy measurements to be made by using a fixed base station and a second roving antenna, known as Real-Time Kinematic (RTK) surveying. The Theodolite, Total station and RTK GPS survey remain the primary methods in use. Remote Sensing and Satellite imagery continues to improve and become less expensive, allowing more commonplace use. New technologies that have become prominent include 3D scanning and the use of LIDAR for topographical surveys. Surveyors determine the position of objects by measuring angles and distances, along with various factors that can affect the accuracy of their observations. From this information, they can calculate more advanced constructs such as vectors, bearings, co-ordinates, elevations, areas, volumes, plans and maps. Measurements are also often split into horizontal and vertical components to simplify calculation. GPS and astronomic measurements also require measurement of a time component. Historically, distances were measured using a variety of means, such as with chains having links of a known length, for instance a Gunter's chain, or measuring tapes made of steel or invar. To measure horizontal distances, these chains or tapes were pulled taut according to temperature, to reduce sagging and slack. Additionally, attempts to hold the measuring instrument level would be made. In instances of measuring up a slope, the surveyor might have to "break" (break chain) the measurement- use an increment less than the total length of the chain. Perambulators, or measuring wheels could be used to measure longer distances but not to a high level of accuracy. Tacheometry is the science of measuring distances by measuring the angle between two ends of an object with a known size, and was sometimes used prior to the invention of EDM where rough ground made chain measurement impractical. Historically, horizontal angles were measured using a compass, which would provide a magnetic bearing, from which deflections could be measured. This type of instrument was later improved, with more carefully scribed discs providing better angular resolution, as well as through mounting telescopes with reticles for more-precise sighting atop the disc (see theodolite). Additionally, levels and calibrated circles allowing measurement of vertical angles were added, along with verniers for measurement to a fraction of a degree—such as with a turn-of-the-century transit. The Plane table provided a graphical method of recording and measuring angles, which reduced the amount of mathematics required. By observing the bearing from every vertex in a figure, a surveyor can measure around the figure and the final observation will be between the two points first observed, except with a 180° difference. This is known as a close. If the first and last bearings are different, this shows the error in the survey, which is known as the angular misclose. The surveyor can use this information to prove that the work meets the expected standards. The simplest method for measuring height is with an altimeter – basically a barometer – using air pressure as an indication of height. But when more precise measurements are needed, a variety of means, such as precise levels (also known as differential leveling), have been developed to do this. When precise leveling, a series of measurements between two points are taken using an instrument and a measuring rod. Differentials in height between the measurements are added and subtracted in a series to derive the net difference in elevation between the two endpoints of the series. With the advent of the Global Positioning System (GPS), elevation can also be derived with sophisticated satellite receivers, but usually with somewhat less accuracy than with traditional precise leveling. However, the accuracies may be similar if the traditional leveling would have to be run over a long distance. When using an optical level, the endpoint to be leveled may be out of the effective range of the instrument, or there may be obstructions or large changes of elevation between the endpoints. In these situations, multiple setups are needed. Turning is a term used when referring to moving the level to take an elevation shot from a different location. In order to "turn" the level, one must first take a reading and record the elevation of the point the rod is located on. While the rod is being kept in exactly the same location, the level is moved to a new location where the rod is still visible. 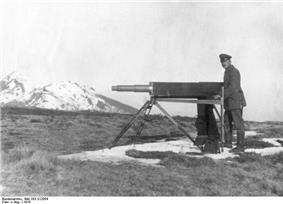 A reading is taken from the new location of the level and the height difference is used to find the new elevation of the level gun. This may then be repeated until the series of measurements is completed. Because the level must be horizontal to obtain a valid measurement, if the horizontal crosshair of the instrument is lower than the base of the rod, the surveyor will not be able to sight the rod and get a reading. The rod can usually be raised up to 25 feet high, allowing the level to be set much higher than the base of the rod. The primary way of determining one's position on the earth's surface when no known positions are nearby is by astronomic observations. Observations to the sun, moon and stars could all be made using navigational techniques. Once the instrument's position and bearing to a star is determined, the bearing can be transferred to a reference point on the earth and which can then be used as a base for further observations. Survey-accurate astronomic positions were difficult to observe and calculate and so tended to be a base off which many other measurements were made. Since the advent of the GPS system, astronomic observations are rare as GPS allows positions to be determined adequately over most of the surface of the earth. Few survey positions are derived from first principles. Instead, most surveys points are measured relative to previously measured points. This forms a reference or control network where each point can be used by a surveyor to determine their own position when beginning a new survey. Triangulation is a method of horizontal location favoured in the days prior to EDM and GPS measurement. With the triangulation method, distances, elevations and directions between objects at great distance from one another can be determined. Since the early days of surveying, this was the primary method of determining accurate positions of objects for topographic maps of large areas. A surveyor first needs to know the horizontal distance between two of the objects, known as the baseline. Then the heights, distances and angular position of other objects can be derived, as long as they are visible from one of the original objects. High-accuracy transits or theodolites were used for this work, and angles between objects were measured repeatedly for increased accuracy. See also Triangulation in three dimensions. Traversing is a common method of surveying smaller areas. Starting from an old reference mark or known position, the surveyor creates a network of reference marks covering the area to be surveyed and then measures bearings and distances between the reference marks, and to the features to be surveyed. Most traverses form a loop pattern or link between two prior reference marks to allow the surveyor to check their measurements are correct. Many surveys do not calculate positions on the surface of the earth, but instead measure the relative positions of objects. However, often the surveyed items need to be compared to outside data, such as boundary lines or previously surveyed objects. The oldest way of describing a position is via latitude and longitude, and often a height above sea level. However, as the surveying profession grew, attempts were made to create Cartesian coordinate systems that simplified the mathematics for surveys which took place over small portions of the earth. The simplest coordinate systems assume that the earth is flat and measure from an arbitrary point, known as a 'datum'. The co-ordinate system allows easy calculation of the distances and direction between objects, but only over a small area due to the earth's curvature. North is often defined as true north at the datum. For larger regions, it is necessary to model the shape of the earth using an ellipsoid or a geoid. Many countries have created co-ordinate grids that are customised to minimise error in their area of the earth. Gross errors or blunders: are errors made by the surveyor during the survey, for example, upsetting the instrument, misaiming at a target, or writing down a measurement wrong. A large gross error may reduce the accuracy to an unacceptable level. Therefore surveyors use redundant measurements and independent checks to detect these errors early in the survey. Systematic errors: are errors that follow a consistent pattern. Examples include effects of temperature on a chain or EDM measurement, or a poorly adjusted spirit-level resulting in a misaligned instrument or target pole. Systematic errors that have known effects can be compensated or corrected. Random errors: Random errors are the small unavoidable measurements caused by imperfections in measuring equipment, eyesight, and conditions. They can be minimized by redundancy of measurement and avoiding unstable conditions. Random errors tend to cancel each other out, but checks must be made to ensure they are not propagating from one measurement to the next. Surveyors avoid propagating errors by ensuring that their equipment is in good condition, using consistent measurement and recording methods, and by good design of their survey reference network. Redundancy of measurements allows the use of averaging and allows outlier measurements to be discarded. Independent checks such as measuring a point from two or more locations or using two different methods means that errors can be detected by comparing the results of the two measurements. Once the surveyor has calculated the magnitude of the errors in his work, it is adjusted. This is the process of distributing the error between all measurements. Each observation is weighted according to how much of the total error it is likely to have caused and part of that error is allocated to it in a proportional way. The most common methods of adjustment are the Bowditch method and the Principle of least squares method. The Surveyor must be able to distinguish between accuracy and precision. In the United States, surveyors and civil engineers use units of feet wherein a survey foot is broken down into 10ths and 100ths. Many deed descriptions requiring distance calls are often expressed using these units (125.25 ft). On the subject of accuracy, surveyors are often held to a standard of one one-hundredth of a foot; about 1/8 inch. Calculation and mapping tolerances are much smaller wherein achieving near-perfect closures are desired. Though tolerances such as this will vary from project to project, in the field and day to day usage beyond a 100th of a foot is often impractical. The main surveying instruments in use around the world are the theodolite and steel band, the total station, the level and rod and surveying GPS systems. 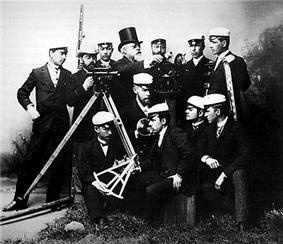 Most instruments are placed on a tripod when in use. Tape measures are often used for measurement of smaller distances. 3D scanners and various forms of aerial imagery are also used. The Theodolite is an instrument for the measurement of angles. It uses two separate circles, protractors or alidades to measure angles in the horizontal and the vertical plane. A telescope is mounted on trunnions allowing it to be aligned vertically with the target object, while the whole upper section rotates to allow horizontal alignment. The vertical circle measures the angle that the telescope makes against the vertical, known as the vertical angle. The horizontal circle uses an upper and lower plate. When beginning the survey, the instrument is aligned towards a known direction (bearing), and the lower plate is clamped into place. The instrument can then be rotated to measure the bearing to other objects. If no bearing is known or direct angle measurement is desired, the instrument can be set to zero during the initial sight and the readings will then be the angle formed between the initial object, the theodolite itself, and the item that the telescope is aligned with. The Gyrotheodolite is a form of theodolite that uses a gyroscope to orient itself in the absence of reference marks. It is used mainly in underground applications. The total station is a development of the theodolite with an electronic distance measurement device (EDM). A total station can also be used for leveling when set to the horizontal plane. Since their introduction, total stations have made the technological shift from being optical-mechanical devices to being fully electronic. Modern top-of-the-line total stations no longer require a reflector or prism to return the light pulses used for distance measurements. They are fully robotic, and can even e-mail point data to a remote computer and connect to satellite positioning systems, such as Global Positioning System. Though Real Time Kinematic GPS systems have increased the speed and precision of surveying, they are still horizontally accurate to only about 20 mm and vertically accurate to about 30–40 mm. GPS surveying differs from other GPS users in the equipment and methods used. Static GPS uses two receivers placed in position for a considerable length of time. The long span of time allows the receiver to compare a large amount of measurements as the satellites move through the sky, ensuring that the measurement network contains well conditioned geometry. This produces a highly accurate baseline that can be very long. (over 20 km) RTK surveying uses one static antenna that is used to monitor the how satellite movement and atmoshperic conditions are altering the GPS signal and a roving antenna that is used to move from one survey measurement to the next. The two antennas are linked by a radio signal that allows the static antenna to send corrections to the roving antenna. The roving antenna then applies those corrections to the GPS signals it is receiving to calculate its own position. RTK surveying is used over smaller distances than Static methods because the conditions further away from the base station will become too different to allow accurate measurement. These surveying instruments each have characteristics that make them suitable for certain uses. In first world countries, theodolites and levels are often used by constructors rather than surveyors because they are relatively cheap and let the constructor perform simple survey tasks independently. Total stations are very versatile and will reliably work under all conditions, making them a workhorse for many professional surveyors. The productivity improvements from a GPS, especially on larger scale surveys, makes them popular for major infrastructure or data gathering projects. One-person robotic-guided total stations allow surveyors to gather precise measurements without extra workers to look through and turn the telescope or record data. A fast but expensive way to measure large areas is with a helicopter, equipped with a laser scanner, combined with a GPS to determine the position and elevation of the helicopter. To increase precision, surveyors place beacons on the ground (about 20 km (12 mi) apart). This method reaches precisions between 5–40 cm (depending on flight height). As well as their primary measuring equipment, surveyors make use of ancillary equipment such as tripods and instrument stands, staves and beacons used for sighting purposes, PPE, vegetation clearing equipment, digging implements for finding survey markers that have been buried over time, hammers for placements of markers in various surfaces and structures, and portable radios for communication over long lines of sight. Specializations of surveying may be classed differently according to the local professional organisation or regulatory body, but may be broadly grouped as follows. As-built survey: a survey carried out during or immediately after a construction project for record, completion evaluation and payment purposes. An as-built survey is also known as a 'works as executed survey' and documents the location of the recently constructed elements that are subject to completion evaluation. As built surveys are often presented in red or redline and overlaid over existing design plans for direct comparison with design information. 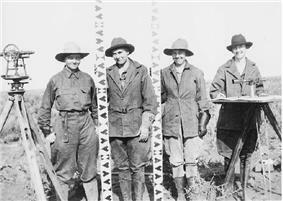 Cadastral or Boundary surveying: a survey that establishes or re-establishes boundaries of a parcel using its legal description, which typically involves the setting or restoration of monuments or markers at the corners or along the lines of the parcel, often in the form of iron rods, pipes, or concrete monuments in the ground, or nails set in concrete or asphalt. A mortgage survey or physical survey is a simple survey that delineates land boundaries and building locations. In many places a mortgage survey is required by lending institutions as a precondition for a mortgage loan. The ALTA/ACSM Land Title Survey is a surveying standard jointly proposed by the American Land Title Association and the American Congress on Surveying and Mapping that incorporates elements of the boundary survey, mortgage survey, and topographic survey. Control surveying: Control surveys establish reference points that surveyors can use to establish their own position at the start of future surveys. Most other forms of surveying will contain elements of control surveying. Deformation survey: a survey to determine if a structure or object is changing shape or moving. The three-dimensional positions of specific points on an object are determined, a period of time is allowed to pass, these positions are then re-measured and calculated, and a comparison between the two sets of positions is made. Dimensional control survey: This is a type of Survey conducted in or on an non-level surface. Commonly used in the oil and gas industry to replace old or damaged pipes on a like-for-like basis, the advantage of dimensional control survey is that the instrument used to conduct the survey does not need to be level. This is advantageous in the off-shore industry, as not all platforms are fixed and are thus subject to movement. Engineering surveying: those surveys associated with the engineering design (topographic, layout and as-built) often requiring geodetic computations beyond normal civil engineering practice. Hydrographic survey: a survey conducted with the purpose of mapping the shoreline and bed of a body of water for navigation, engineering, or resource management purposes. Photographic control survey: A survey that creates reference marks clearly visible from the air to allow aerial photographs to be rectified. 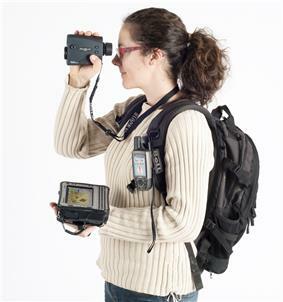 Stakeout, Layout or Setout: an element of many other surveys where the calculated or proposed position of an object is marked on the ground, either temporarily or permanently. This is an important component of engineering and cadastral surveying. Structural survey: a detailed inspection to report upon the physical condition and structural stability of a building or other structure and to highlight any work needed to maintain it in good repair. The basic principles of surveying have changed little over the ages, but the tools used by surveyors have evolved tremendously. Engineering, especially civil engineering, depends heavily on surveyors. Whenever there are roads, railways, reservoir, dams, pipeline transports retaining walls, bridges or residential areas to be built, surveyors help determine the placement of structures. They establish the boundaries of legal descriptions and the boundaries of various lines of political divisions. They also provide advice and data for geographical information systems (GIS), computer databases that contain data on land features and boundaries. Surveyors must have a thorough knowledge of algebra, basic calculus, geometry, and trigonometry. They must also know the laws that deal with surveys, property, and contracts. Most jurisdictions recognise three different levels of qualification. Survey Assistants or Chainmen are usually unqualified employees who help the surveyor by placing target reflectors, finding old reference marks and marking points on the ground. The term 'chainman' derives from past use on measuring chains, where the assistant would be required to move their end of the chain under the surveyor's direction. Survey Technicians may be qualified or unqualified and their roles may include operation of survey instruments, running of surveys in the field, survey calculations and drafting of plans. However, a technician typically has no special legal powers and cannot certify their work. Qualifications are typically to the certificate or diploma level. Licensed, registered or chartered surveyors usually hold a degree or higher qualification and are often required to pass additional exams to gain entrance to a professional association or gain their certification status. Surveyors are responsible for planning and management of surveys and ensuring that their surveys, or surveys performed under their supervision, meet the necessary legal standards. Many principals of surveying firms hold this status. Not all surveys are carried out by professional surveyors. Depending on the jurisdiction and circumstances, the builders of a structure may set it out themselves, or have a surveyor lay out some significant corners of it and then lay out the rest of the building themselves using a variety of techniques. Licensing requirements vary with jurisdiction, and are commonly consistent within national borders. 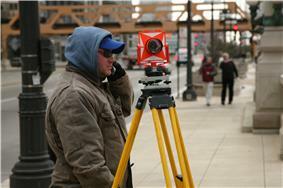 In most of the United States, surveying is recognized as a distinct profession apart from engineering. Licensing requirements vary by state, but they generally have components of education, experience and examinations. In the past, experience gained through an apprenticeship, together with passing a series of state-administered examinations, was required to attain licensure. Now, most states insist upon basic qualification of a degree in surveying, plus experience and examination requirements. The licensing process typically follows two phases. First, upon graduation, the candidate may be eligible to take the Fundamentals of Surveying (FS) exam, to be certified upon passing and meeting all other requirements as a surveying intern (SI),(formerly surveyor in training (SIT)). Upon being certified as an SI, the candidate then needs to gain additional experience to become eligible for the second phase. That typically consists of the Principles and Practice of Land Surveying (PS) exam along with a state-specific examination. Licensed surveyors usually denote themselves with the letters P.L.S. (professional land surveyor), P.S. (professional surveyor), L.S. (land surveyor), R.L.S. (registered land surveyor), R.P.L.S. (Registered Professional Land Surveyor), or P.S.M. (professional surveyor and mapper) following their names, depending upon the dictates of their particular jurisdiction of registration. In Canada, land Surveyors are registered to work in their respective province. The designation for a land surveyor breaks down by province, but follows the rule whereby the first letter indicates the province, followed by L.S. There is also a designation as a C.L.S. or Canada lands surveyor, who has the authority to work on Canada Lands, which include Indian Reserves, National Parks, the three territories and offshore lands. In many Commonwealth countries, the term Chartered Land Surveyor is used for someone holding a professional license to conduct surveys. A licensed land surveyor is typically required to sign and seal all plans, the format of which is dictated by their state jurisdiction, which shows their name and registration number. In many states, when setting boundary corners land surveyors are also required to place survey monuments bearing their registration numbers, typically in the form of capped iron rods, concrete monuments, or nails with washers. Most countries regulate at least some forms of surveying via a government survey department that establishes regulations and standards. Standards often deal with accuracy tolerances, who is allowed to call themselves a surveyor, types of monumentation used for boundaries, and maintenance of geodetic networks. Many countries devolve this power to states or regional entities. Cadastral Surveys tend to be the most heavily regulated because of the permanence of the work: lot boundaries established by a cadastral survey can potentially stand for hundreds of years without modification. Most Jurisdictions also have some form of professional institution representing themselves as a whole. These institutes often have a hand in endorsing or licencing potential surveyors as well as setting and enforcing ethical standards. The largest such institution is International Federation of Surveyors (Abbreviated FIG for French: Fédération Internationale des Géomètres), which represents the survey industry worldwide. In the United States, Canada, the United Kingdom and most Commonwealth countries building surveying is considered to be a distinct profession. Land surveyors have their own professional associations and licencing requirements. The services of a licenced land surveyor are generally required for boundary surveys (to establish the boundaries of a parcel using its legal description) and subdivision plans (a plot or map based on a survey of a parcel of land, with boundary lines drawn inside the larger parcel to indicated the creation of new boundary lines and roads). One of the primary roles of the land surveyor is to determine the boundary of real property on the ground. That boundary has already been established and described in legal documents and official plans and maps prepared by attorneys, engineers, and other land surveyors. The corners of the property will either have been monumented by a prior surveyor, or monumented by the surveyor hired to perform a survey of a new boundary which has been agreed upon by adjoining land owners. Cadastral land surveyors are licensed by governments. In the United States, cadastral surveys are typically conducted by the federal government, specifically through the Cadastral Surveys branch of the Public Land Survey System (PLSS), surveyors carry out BLM Cadastral Surveys in accordance with that system. Over time, construction and maintenance of roads and many other acts of man, along with acts of nature such as earthquakes, movement of water, and tectonic shift can obliterate or damage the monumented locations of land boundaries. The land surveyor is often compelled to consider other evidence such as fence locations, wood lines, monuments on neighboring properties and recollections of people. This other evidence is known as Extrinsic Evidence and is a fairly common principle. Extrinsic evidence is defined as evidence outside the writings, in this case the deed. Extrinsic evidence is held to be synonymous with evidence from another source. F.V. 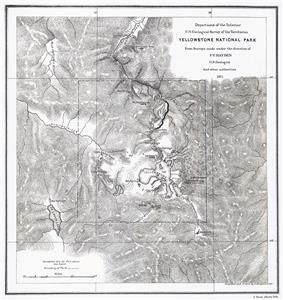 Hayden's map of Yellowstone National Park, 1871. His surveys were a significant factor toward establishing the park in 1872. Many properties have considerable problems in regard to improper bounding, miscalculations in past surveys, titles, easements, and wildlife crossings. Also many properties are created from multiple divisions of a larger piece over the course of years, and with every additional division the risk of miscalculation increases. The result can be abutting properties not coinciding with adjacent parcels, resulting in hiatuses (gaps) and overlaps. Many times a surveyor must solve a puzzle using pieces that do not exactly fit together. In these cases, the solution is based upon the surveyor's research and interpretation, along with established procedures for resolving discrepancies. This essentially is a process of continual error correction and update, where official recordation documents countermand the previous and sometime erroneous survey documents recorded by older monuments and older survey methods. ^ Lewis, M. J. T. (2001-04-23). Surveying Instruments of Greece and Rome. Cambridge University Press. ^ Sturman, Brian; Wright, Alan. "The History of the Tellurometer". http://www.fig.net/. International Federation of Surveyors. Retrieved 20 July 2014. ^ Cheves, Marc. "Geodimeter-The First Name in EDM". http://www.profsurv.com/magazine/. Retrieved 2014-07-20. ^ Mahun, Jerry. "Electronic Distance Measurement". Jerrymahun.com. Retrieved 2014-07-20. ^ Kahmen, Heribert; Faig, Wolfgang (1988). Surveying. Berlin: de Gruyter. p. 9.